Powers and Abilities They can manipulate the mere nature of "love" itself. What human myth has mistaken for "Cupid" is actually a lower order of angel. Technically it's a cherub, third-class. Cherubs are angels of Heaven who are part of a lower order, colloquially known as "cupids." At one point there were dozens of them stationed on Earth who were responsible for locating humans deemed important enough by Heaven to make them fall in love. One important couple brought together by a cherub was John Winchester and Mary Campbell. Their marriage was "top priority," and the cherub met by Sam and Dean tells them that John and Mary couldn't stand one another at first. While the angelic civil wars in Heaven raged, it appeared that the cupids stationed on Earth began to gradually lose contact with their superiors; the daily orders from Heaven of who to match together became fewer and fewer. It is assumed that once the council of angels took on leadership and brought order to Heaven once more, orders for the cherubs resumed on a daily basis. A cherub's bow and arrow. Cherubs, like all angels, require vessels to walk the Earth. They differentiate from other angels through their "bow and arrow"; while Cupid is typically depicted holding a physical bow and arrow, a cherub's bow and arrow appears as a tattoo on the palm of their vessel's hand, allowing them to make connections between humans with a simple touch. Like all angel classes, they are stronger than humans -- hence when Dean punches one in the face, the cherub is unharmed, while Dean clutches his hand in pain. They greet people and other angels by hugging them... Nobody likes it. Invisibility - Cherubs can render themselves invisible to the naked eye by occupying space within the Veil. Invulnerability - As with all angels, a cherub's durability far exceeds that of humans. Super strength - While a lower order of angels, a cherub's strength still far exceeds that of a typical human. Teleportation - Like all angels, cherubs had the ability to teleport, which was removed after the Fall. Angel blade / sword - Cherubs can be killed or injured by the weapons of Heaven. Extracting grace - Like all angels, removal of a cherub's grace will render them human, with human weaknesses. Holy oil - Can trap a cherub, as well as cause death upon contact. Dean, Sam, and Castiel make their way to a small restaurant while searching for a Cupid. Soon after their arrival Castiel notices a supernatural disturbance. He follows the entity into a back room and somehow traps him. Castiel then demands that the entity show itself to Dean and Sam. The cupid manifests as a naked man, and immediately embraces the two hunters and the angel strongly. Castiel demands to know if the cupid is responsible for the deaths of a couple he brought together. The cupid explains that he touched the couple's hearts as instructed, and did not know what happened after that. Castiel is still suspicious, so the cupid asks Castiel to read his mind to see the truth. Castiel agrees, and after a few moments declares that the cupid is innocent. The cupid then reveals to Dean and Sam the truth about how John and Mary met; Dean is disgusted by the cupid's remarks, and punches him in the face. Dean staggers back, and the cupid, though unharmed, is overcome by emotion and disappears. A cupid was referenced by Balthazar as a possible traitor in an attempt to draw suspicion off of him. After meeting their grandfather Henry Winchester, Sam finally understands what the cupid was talking about when he told them how their parents were brought together: Heaven was bringing the Winchesters and the Campbells together -- the brains and the brawn of the supernatural world. Metatron tells Castiel that the second trial required to close Heaven is to obtain the bow of a cupid. Metatron has ascertained that Dwight Charles - a bartender - will be shot by a Cupid's arrow. He and Metatron start watching Dwight, but Naomi arrives and abducts Metatron. Castiel turns to Dean for help. When they see a delivery woman, Gail, arrive at the bar, they think she will be the one that Dwight falls in love with. However she is the cupid, and she causes Dwight and his regular customer Rod to fall in love. 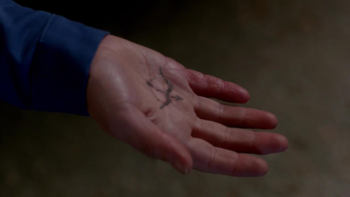 Outside the bar, Dean and Castiel tell the cupid they need her bow, which appears as a mark on her hand. She tells them how chaotic Heaven is, and willingly helps them. At a diner where Castiel and Metatron have stopped to allow Metatron to eat, they catch the attention of a cupid. 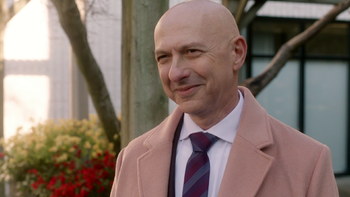 After Cas and Metatron leave the diner, the are confronted by the cupid, who tells them that they both have corrupted Heaven and that it will never be the same, before he attacks them. 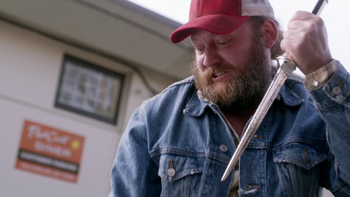 The cupid gets the upper hand in the fight, and as he is about to deliver a death blow to Castiel, Metatron stops him by stabbing him in the back with an angel sword. A "Cupid" causes a rollerblading women to fall into the arms of a baker, causing the two to fall in love. Lucifer, witnessing this, congratulates the angel on a job well done. Lucifer soon take the angel into an alley where he siphons off his grace, rendering the cherub human. Lucifer asks the cherub where he can find other angels, but the fearful cherub says he doesn't know, revealing that there are not many angels anymore. The cherub begins begging Lucifer for mercy; Lucifer starts to comfort the newly human angel before driving his arm through the cherub's body and killing him. Cherubs, or Cherubim, are an order of angels that are of a lower ranking than Seraphs but they outclass all other angels of the angelic choir or spheres which divides, separates, and fully compromises the angelic society. They guard, watch, and monitor God's throne room at all times. They have four different faces, each representing a different organism, and have four wings that are used for flight. 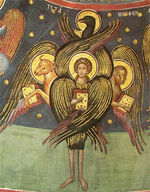 Two of the wings extend upward, meeting above and sustaining the throne of God, while the other two stretch downward and cover the creatures themselves. God also stationed two Cherubs at the gate of the Garden of Eden. This page was last edited on 18 March 2019, at 23:49.